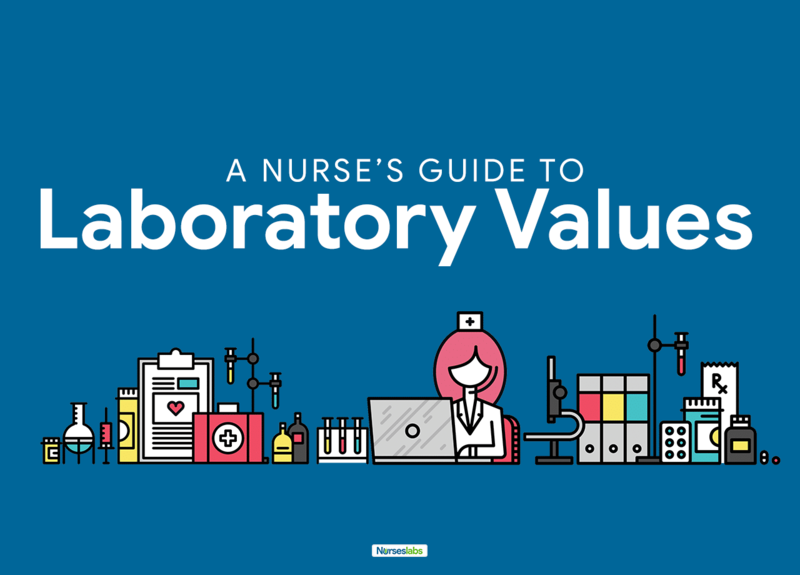 Knowing the different normal lab values is an important step in making an informed clinical decision as a nurse. Diagnostic and laboratory tests are tools that provide invaluable insights and information about the patient. Lab tests are used to help confirm a diagnosis, monitor an illness, and the patient’s response to treatment. In the NCLEX, some questions supply laboratory results with no indication of the normal lab levels so you’ll have to familiarize yourself with them. NCLEX will not give you values that are within normal range. Questions will usually include critical lab values and it’s a matter of identifying if it’s within normal range or not. Please note that laboratory values may vary from agency to agency. Diagnostic testing involves three phases: pretest, intratest, and post-test. Nurses have responsibilities for each phase of diagnostic testing. Assessment of the patient to assist in determining precautions. Preparation of the equipment and supplies needed. Preparation of a consent form, if required. Providing information and answering client questions about the procedure. Use of standard precautions or sterile technique if necessary. Providing emotional support to the patient and monitoring the patient’s response during the procedure. Ensuring the correct labeling, storage, and transportation of the specimen. Reporting of the results to the appropriate members of the healthcare team. 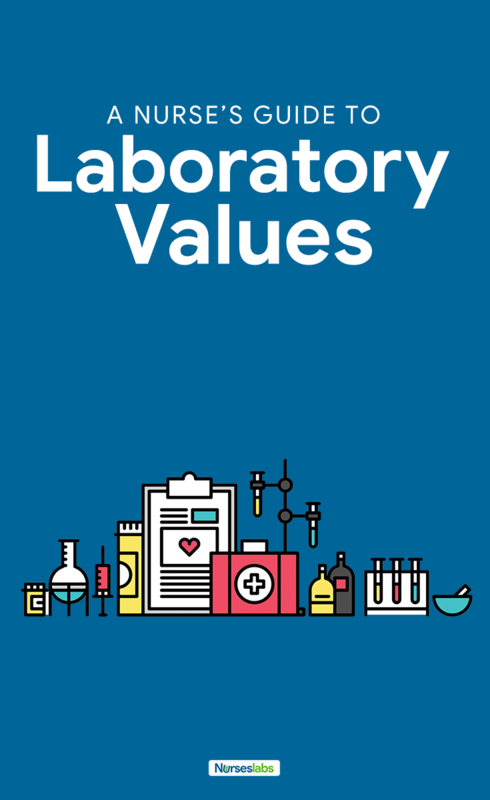 Summary of the different normal laboratory values. You can learn more about each diagnostic testing in the sections ahead. Activated partial thromboplastin time (APTT): 20 to 60 seconds, depending on the type of activator used. International Normalized Ratio (INR): The INR standardizes the PT ratio and is calculated in the laboratory setting by raising the observed PT ratio to the power of the international sensitivity index specific to the thromboplastin reagent used. Normal: 500 to 1600 cells/L. Hepatitis A: Presence of immunoglobulin M (IgM) antibody to Hepatitis A and presence of total antibody (IgG and IgM) may suggest recent or current Hep A infection. Hepatitis B: Detection of Hep B core Antigen (HBcAg), envelope antigen (HBeAg), and surface antigen (HBsAg), or their corresponding antibodies. Hepatitis C: Confirmed by the presence of antibodies to Hep C virus. Hepatitis D: Detection of Hep D antigen (HDAg) early in the course of infection and detection of Hep D virus antibody in later stages of the disease. Hepatitis E: Specific serological tests for hepatitis E virus include detection of IgM and IgG antibodies to hepatitis E.
Here are the normal lab values related to erythrocyte studies which include hemoglobin, hematocrit, red blood cell count, serum iron, and erythrocyte sedimentation rate. Venous blood is used as a specimen for completed blood count (CBC) which is a basic screening test that is frequently ordered to give an idea about the health of a patient. Red blood cells or erythrocytes transport oxygen from the lungs to the bodily tissues. RBCs are produced in the red bone marrow, can survive in the peripheral blood for 120 days, and are removed from the blood through the bone marrow, liver, and spleen. Helps in diagnosing anemia and blood dyscrasia. Hemoglobin is the protein component of red blood cells that serves as a vehicle for oxygen and carbon dioxide transport. It is composed of a pigment (heme) which carries iron, and a protein (globin). The hemoglobin test is a measure of the total amount of hemoglobin in the blood. Hemoglobin count is indicated to help measure the severity of anemia (low hemoglobin) or polycythemia (high hemoglobin). Monitor the effectiveness of a therapeutic regimen. Hematocrit or packed cell volume (Hct, PCV, or crit) represents the percentage of the total blood volume that is made up of the red blood cell (RBC). Red blood cell indicates (RBC Indices) determine the characteristics of an RBC. It is useful in diagnosing pernicious and iron deficiency anemias and other liver diseases. Mean corpuscular volume (MCV): The average size of the individual RBC. Mean corpuscular hemoglobin (MCH): The amount of Hgb present in one cell. Mean corpuscular hemoglobin concentration (MCHC): The proportion of each cell occupied by the Hgb. Iron is essential for the production of blood helps transport oxygen from the lungs to the tissues and carbon dioxide from the tissues to the lungs. Helps in diagnosing anemia and hemolytic disorder. Recent intake of a meal containing high iron content may affect the results. Drugs that may cause decreased iron levels include adrenocorticotropic hormone, cholestyramine, colchicine, deferoxamine, and testosterone. Drugs that may cause increased iron levels include dextrans, ethanol, estrogens, iron preparations, methyldopa, and oral contraceptives. Erythrocyte sedimentation rate (ESR) is a measurement of the rate at which erythrocytes settle in a blood sample within one hour. Assist in the diagnosis of conditions related to acute and chronic infection, inflammation, and tissue necrosis or infarction. The normal laboratory value for WBC count has two components: the total number of white blood cells and differential count. Neutrophils are the most common type of WBC and serve as the primary defense against infection. Lymphocytes play a big role in response to inflammation or infection. Monocytes are cells that respond to infection, inflammation, and foreign bodies by killing and digesting the foreign organism (phagocytosis). Eosinophils respond during an allergic reaction and parasitic infections. Basophils are involved during an allergic reaction, inflammation, and autoimmune diseases. Bands are immature WBCs that are first released from the bone marrow into the blood. A high total WBC count with a left shift means that the bone marrow will release an increased amount of neutrophils in response to inflammation or infection. A “shift to the right” which is usually seen in liver disease, megaloblastic and pernicious anemia, and Down syndrome, indicates that cells have more than the usual number of nuclear segments. A “shift to the left” indicates an increased number of immature neutrophils is found in the blood. A low total WBC count with a left shift means a recovery from bone marrow depression or an infection of such intensity that the demand for neutrophils in the tissue is greater than the capacity of the bone marrow to release them into the circulation. Physicians order coagulation studies such as platelet count, activated partial thromboplastin time, prothrombin time, international normalized ratio, bleeding time, and D-dimer to evaluate the clotting function of an individual. In this section, we’ll discuss the indications and nursing implications of each lab test. Platelets are produced in the bone marrow and play a role in hemostasis. Platelets function in hemostatic plug formation, clot retraction, and coagulation factor activation. High altitudes, persistent cold temperature, and strenuous exercise increase platelet counts. Assess the venipuncture site for bleeding in clients with known thrombocytopenia. Bleeding precautions should be instituted in clients with a low platelet count. Activated partial thromboplastin time (APTT) evaluates the function of the contact activation pathway and coagulation sequence by measuring the amount of time it requires for recalcified citrated plasma to clot after partial thromboplastin is added to it. The test screens for deficiencies and inhibitors of all factors, except factors VII and XIII. 20 to 60 seconds, depending on the type of activator used. Monitors the effectiveness of heparin therapy. Detect coagulation disorders in clotting factors such as hemophilia A (factor VIII) and hemophilia B (factor IX). Determine individuals who may be prone to bleeding during invasive procedures. Do not draw samples from an arm into which heparin is infusing. If the client is receiving intermittent heparin by intermittent injection, plan to draw the blood sample 1 hour before the next dose of heparin. Apply direct pressure to the venipuncture site. Blood specimen should be transported to the laboratory immediately. The aPTT should be between 1.5 and 2.5 times normal when the client is receiving heparin therapy. Monitor for signs of bleeding if the aPTT value is longer than 90 seconds in a patient receiving heparin therapy. Prothrombin is a vitamin K-dependent glycoprotein produced by the liver that is essential for fibrin clot formation. Each laboratory establishes a normal or control value based on the method used to perform the PT test. The PT measures the amount of time it takes in seconds for clot formation, the international normalized ratio (INR) is calculated from a PT result to monitor the effectiveness of warfarin. Monitor response to warfarin sodium (Coumadin) therapy. Screen for dysfunction of the extrinsic clotting system resulting from vitamin K deficiency disseminated intravascular coagulation or liver disease. Critical value: >20 seconds for persons who do not use anticoagulants. The INR standardizes the PT ratio and is calculated in the laboratory setting by raising the observed PT ratio to the power of the international sensitivity index specific to the thromboplastin reagent used. If a PT is prescribed, the baseline specimen should be drawn before anticoagulation therapy is started; note the time of collection on the laboratory form. Provide direct pressure to the venipuncture site for 3 to 5 minutes. Concurrent warfarin therapy with heparin therapy can lengthen the PT for up to 5 hours after dosing. Diets high in green leafy vegetables can increase the absorption of vitamin K, which shortens the PT. Orally administered anticoagulation therapy usually maintains the PT at 1.5 to 2 times the laboratory control value. Initiate bleeding precautions, if the PT value is longer than 30 seconds in a client receiving warfarin therapy. Bleeding time assess the overall hemostatic function (platelet response to injury and vasoconstrictive ability). Useful in detecting disorders of platelet function. Assess and validate that the client has not been receiving anticoagulants, aspirin, or aspirin-containing products for 3 days prior to the test. Inform the client that punctures are made to measure the time it takes for bleeding to stop. Apply pressure dressing to clients with bleeding tendencies after the procedure. D-Dimer is a blood test that measures clot formation and lysis that results from the degradation of fibrin. Helps to diagnose the presence of thrombus in conditions such as deep vein thrombosis, pulmonary embolism, or stroke. Used to diagnose disseminated intravascular coagulation (DIC). Monitor the effectiveness of treatment. Electrolytes are minerals that are involved in some of the important functions in our body. Serum electrolytes are routinely ordered for a patient admitted to a hospital as a screening test for electrolyte and acid-base imbalances. Here we discuss the normal lab values of the commonly ordered serum tests: potassium, serum sodium, serum chloride, and serum bicarbonate. Serum electrolytes may be ordered as a “Chem 7” or as a “basic metabolic panel (BMP)”. Potassium is the most abundant intracellular cation that serves important functions such as regulate acid-base equilibrium, control cellular water balance, and transmit electrical impulses in skeletal and cardiac muscles. Evaluates cardiac function, renal function, gastrointestinal function, and the need for IV replacement therapy. Note on the laboratory form if the client is receiving potassium supplementation. Clients with elevated white blood cell counts and platelet counts may have falsely elevated potassium levels. Sodium is a major cation of extracellular fluid that maintains osmotic pressure and acid-base balance, and assists in the transmission of nerve impulses. Sodium is absorbed from the small intestine and excreted in the urine in amounts dependent on dietary intake. Monitor the effectiveness of drug, especially diuretics, on serum sodium levels. Drawing blood samples from an extremity in which an intravenous (IV) solution of sodium chloride is infusing increases the level, producing inaccurate results. Chloride is a hydrochloric acid salt that is the most abundant body anion in the extracellular fluid. Functions to counterbalance cations, such as sodium, and acts as a buffer during oxygen and carbon dioxide exchange in red blood cells (RBCs). Aids in digestion and maintaining osmotic pressure and water balance. Any condition accompanied by prolonged vomiting, diarrhea, or both will alter chloride levels. Part of the bicarbonate-carbonic acid buffering system and mainly responsible for regulating the pH of body fluids. Ingestion of acidic or alkaline solutions may cause increased or decreased results, respectively. Calcium (Ca+) is a cation absorbed into the bloodstream from dietary sources and functions in bone formation, nerve impulse transmission, and contraction of myocardial and skeletal muscles. Calcium aids in blood clotting by converting prothrombin to thrombin. Instruct the client to eat a diet with a normal calcium level (800 mg/day) for 3 days before the exam. Phosphorus (Phosphate) is important in bone formation, energy storage and release, urinary acid-base buffering, and carbohydrate metabolism. Phosphorus is absorbed from food and is excreted by the kidneys. High concentrations of phosphorus are stored in bone and skeletal muscle. Magnesium is used as an index to determine metabolic activity and renal function. Magnesium is needed in the blood-clotting mechanisms, regulates neuromuscular activity, acts as a cofactor that modifies the activity of many enzymes, and has an effect on the metabolism of calcium. Long-term parenteral nutrition therapy or excessive loss of body fluids may decrease serum levels. Serum osmolality is a measure of the solute concentration of the blood. Particles include sodium ions, glucose, and urea. Serum osmolality is usually estimated by doubling the serum sodium because sodium is a major determinant of serum osmolality. In this section, we’ll be discussing the normal laboratory values of serum creatinine and blood urea nitrogen, including their indications and nursing considerations. These laboratory tests are helpful in determining the kidney function of an individual. Creatinine is a specific indicator of renal function. Increased levels of creatinine indicate a slowing of the glomerular filtration rate. Instruct the client to avoid excessive exercise for 8 hours and excessive red meat intake for 24 hours before the test. Urea nitrogen is the nitrogen portion of urea, a substance formed in the liver through an enzymatic protein breakdown process. Urea is normally freely filtered through the renal glomeruli, with a small amount reabsorbed in the tubules and the remainder excreted in the urine. Elevated levels indicate a slowing of the glomerular filtration rate. BUN and creatinine ratios should be analyzed when renal function is evaluated. Understanding the normal laboratory values of blood glucose is an essential key in managing diabetes mellitus. Included in this section are the lab values and nursing considerations for glycosylated hemoglobin, fasting blood sugar, glucose tolerance test, and diabetes mellitus antibody panel. Fasting blood glucose or fasting blood sugar (FBS) levels are used to help diagnose diabetes mellitus and hypoglycemia. Glucose is a monosaccharide found in fruits and is formed from the digestion of carbohydrates and the conversion of glycogen by the liver. Glucose is the main source of cellular energy for the body and is essential for brain and erythrocyte function. Instruct the client to fast for 8 to 12 hours before the test. Instruct a client with diabetes mellitus to withhold morning insulin or oral hypoglycemic medication until after the blood is drawn. The glucose tolerance test (GTT) aids in the diagnosis of diabetes mellitus. If the glucose levels peak at higher than normal at 1 and 2 hours after injection or ingestion of glucose and are slower than normal to return to fasting levels, then diabetes mellitus is confirmed. Instruct the client to eat a high-carbohydrate (200 to 300 g) diet for 3 days before the test. Instruct the client to avoid alcohol, coffee, and smoking for 36 hours before the test. Instruct the client to avoid strenuous exercise for 8 hours before and after the test. Instruct the client to fast for 10 to 16 hours before the test. Instruct the client with diabetes mellitus to withhold morning insulin or oral hypoglycemic medication. Instruct the client that the test may take 3 to 5 hours, requires IV or oral administration of glucose, and the taking of multiple blood samples. Glycosylated hemoglobin is blood glucose bound to hemoglobin. Hemoglobin A₁C (glycosylated hemoglobin A; HbA1c) is a reflection of how well blood glucose levels have been controlled for the past 3 to 4 months. Hyperglycemia in clients with diabetes is usually a cause of an increase in the HbA1c. Used to evaluate insulin resistance and to identify type 1 diabetes and clients with a suspected allergy to insulin. Arterial Blood Gases (ABGs) are measured in a laboratory test to determine the extent of compensation by the buffer system. It measures the acidity (pH) and the levels of oxygen and carbon dioxide in arterial blood. Blood for an ABG test is taken from an artery whereas most other blood tests are done on a sample of blood taken from a vein. To help you interpret ABG results, check out our 8-Step Guide to ABG Analysis Tic-Tac-Toe Method. Conditions affecting the gastrointestinal tract can be easily evaluated by studying the normal laboratory values of alanine aminotransferase, aspartate aminotransferase, bilirubin, albumin, ammonia, amylase, lipase, protein, and lipids. Alanine Aminotransferase (ALT) test is used to identify hepatocellular injury and inflammation of the liver and to monitor improvement or worsening of the disease. ALT was formerly known as serum pyretic transaminase (SGPT). Previous intramuscular injections may cause elevated levels. Aspartate Aminotransferase (AST) test is used to evaluate a client with a suspected hepatocellular disease, injury, or inflammation (may also be used along with cardiac markers to evaluate coronary artery occlusive disease). AST was formerly known as serum glutamic-oxaloacetic transaminase (SGOT). Bilirubin is produced by the liver, spleen, and bone marrow and is also a by-product of hemoglobin breakdown. Total bilirubin levels can be broken into direct bilirubin, which is excreted primarily via the intestinal tract, and indirect bilirubin, which circulates primarily in the bloodstream. Total bilirubin levels increase with any type of jaundice; direct and indirect bilirubin levels help differentiate the cause of jaundice. Instruct the client to eat a diet low in yellow foods, avoiding foods such as carrots, yams, yellow beans, and pumpkin, for 3 to 4 days before the blood is drawn. Instruct the client to fast for 4 hours before the blood is drawn. Note that results will be elevated with the ingestion of alcohol or the administration of morphine sulfate, theophylline, ascorbic acid (vitamin C), or acetylsalicylic acid (Aspirin). Note that results are invalidated if the client has received a radioactive scan within 24 hours before the test. Albumin is the main plasma protein of blood that maintains oncotic pressure and transports bilirubin, fatty acids, medications, hormones, and other substances that are insoluble in water. Albumin is increased in conditions such as dehydration, diarrhea, and metastatic carcinoma; decreased in conditions such as acute infection, ascites, and alcoholism. Presence of detectable albumin, or protein, in the urine is indicative of abnormal renal function. Ammonia is a by-product of protein catabolism; most of it is created by bacteria acting on proteins present in the gut. Ammonia is metabolized by the liver and excreted by the kidneys as urea. Elevated levels resulting from hepatic dysfunction may lead to encephalopathy. Venous ammonia levels are not a reliable indicator of hepatic coma. Instruct the client to fast, except for water, and to refrain from smoking for 8 to 10 hours before the test; smoking increases ammonia levels. Place the specimen on ice and transport to the laboratory immediately. Amylase is an enzyme, produced by the pancreas and salivary glands, aids in the digestion of complex carbohydrates and is excreted by the kidneys. In acute pancreatitis, the amylase level may exceed five times the normal value; the level starts rising 6 hours after the onset of pain, peaks at about 24 hours, and returns to normal in 2 to 3 days after the onset of pain. In chronic pancreatitis, the rise in serum amylase usually does not normally exceed three times the normal value. On the laboratory form, list the medications that the client has taken during the previous 24 hours before the test. Note that many medications may cause false-positive or false-negative results. Results are invalidated if the specimen was obtained less than 72 hours after cholecystography with radiopaque dyes. Lipase is a pancreatic enzyme converts fats and triglycerides into fatty acids and glycerol. Elevated lipase levels occur in pancreatic disorders; elevations may not occur until 24 to 36 hours after the onset of illness and may remain elevated for up to 14 days. Endoscopic retrograde cholangiopancreatography (ERCP) may increase lipase activity. Serum protein reflects the total amount of albumin and globulins in the plasma. Protein regulates osmotic pressure and is necessary for the formation of many hormones, enzymes, and antibodies; it is a major source of building material for blood, skin, hair, nails, and internal organs. Increased in conditions such as Addison’s disease, autoimmune collagen disorders, chronic infection, and Crohn’s disease. Decreased in conditions such as burns, cirrhosis, edema, and severe hepatic disease. Lipid assessment or lipid profile includes total cholesterol, high-density lipoprotein (HDL), low-density lipoprotein (LDL), and triglycerides. Cholesterol is present in all body tissues and is a major component of LDL, brain, and nerve cells, cell membranes, and some gallbladder stones. Triglycerides constitute a major part of very-low-density lipoproteins and a small part of LDLs. Increased cholesterol levels, LDL levels, and triglyceride levels place the client at risk for coronary artery disease. HDL helps protect against the risk of coronary artery disease. Oral contraceptives may increase the lipid level. Instruct the client to abstain from foods and fluid, except for water, for 12 to 14 hours and from alcohol for 24 hours before the test. Instruct the client to avoid consuming high-cholesterol foods with the evening meal before the test. Serum enzymes and cardiac markers are released into the circulation normally following a myocardial injury as seen in acute myocardial infarction (MI) or other conditions such as heart failure. CK-MM is found mainly in skeletal muscle. If the test is to evaluate skeletal muscle, instruct the client to avoid strenuous physical activity for 24 hours before the test. Instruct the client to avoid ingestion of alcohol for 24 hours before the test. Invasive procedures and intramuscular injections may falsely elevate CK levels. Myoglobin, an oxygen-binding protein that is found in striated (cardiac and skeletal) muscle, releases oxygen at very low tensions. Any injury to skeletal muscle will cause a release of myoglobin into the blood. Myoglobin rise in 2-4 hours after an MI making it an early marker for determining cardiac damage. The level can rise as early as 2 hours after a myocardial infarction, with a rapid decline in the level after 7 hours. Because the myoglobin level is not cardiac specific and rises and falls so rapidly, its use in diagnosing myocardial infarction may be limited. Troponin is a regulatory protein found in striated muscle (myocardial and skeletal). Increased amounts of troponin are released into the bloodstream when an infarction causes damage to the myocardium. Troponin levels are elevated as early as 3 hours after MI. Troponin I levels may remain elevated for 7 to 10 days and Troponin T levels may remain elevated for as long as 10 to 14 days. Serial measurements are important to compare with a baseline test; elevations are clinically significant in the diagnosis of cardiac pathology. Testing is repeated in 12 hours or as prescribed, followed by daily testing for 3 to 5 days. C-type natriuretic peptides (CNP) synthesized by endothelial cells. BNP is the primary marker for identifying heart failure as the cause of dyspnea. The higher the BNP level, the more severe the heart failure. If the BNP level is elevated, dyspnea is due to heart failure; if it is normal, the dyspnea is due to a pulmonary problem. The following laboratory tests are used to diagnose human immunodeficiency virus (HIV), which is the cause of acquired immunodeficiency syndrome (AIDS). Common tests used to determine the presence of antibodies to HIV include ELISA, Western blot, and Immunofluorescence assay (IFA). A single reactive ELISA test by itself cannot be used to diagnose HIV and should be repeated in duplicate with the same blood sample; if the result is repeatedly reactive, follow-up tests using Western blot or IFA should be performed. A positive Western blot or IFA results is considered confirmatory for HIV. A positive ELISA result that fails to be confirmed by Western blot or IFA should not be considered negative, and repeat testing should take place in 3 to 6 months. CD4+ T-cell counts help Monitors the progression of HIV. As the condition progresses, usually the number of CD4+ T-cells decreases, with a resultant decrease in immunity. In general, the immune system remains healthy with CD4+ T-cell counts higher than 500 cells/L. Immune system problems occur when the CD4+ T-cell count is between 200 and 499 cells/L. Severe immune system problems occur when the CD4+ T-cell count is lower than 200 cells/L. Thyroid studies are performed if a thyroid disorder is suspected. Common laboratory blood tests such as thyroxine, TSH, T4, and T3 are done to evaluate thyroid function. Thyroid studies help differentiate primary thyroid disease from secondary causes and from abnormalities in thyroxine-binding globulin levels. Thyroid peroxidase antibodies test may be done to identify the presence of autoimmune conditions involving the thyroid gland. Results of the test may be invalid if the client has undergone a radionuclide scan within 7 days before the test. Serological tests for specific hepatitis virus markers assist in determining the specific type of hepatitis. Tests for hepatitis include radioimmunoassay, enzyme-linked immunosorbent assay (ELISA), and microparticle enzyme immunoassay. If the radioimmunoassay technique is being used, the injection of radionuclides within 1 week before the blood test is performed may cause falsely elevated results. Identify the client. Accurately identify the client by asking his or her name and birthdate; Explain the reason for the test and procedure to the client. Proper position. Blood samples should be drawn in a sitting position and the client should remain in that position for at least 5 minutes before the blood collection. Confirm the request. Check the laboratory form for the ordered test, client information, and additional requirements (fasting, dietary restrictions, medications). Provide comfort. Make sure the client remove any tight clothing that might constrict the upper arm. The arm is placed in a downward position supported on the armrest. Ensure proper hand hygiene. Perform hand washing before putting on non-latex gloves. Identify the vein. Examine the client’s arm to select the most easily accessible vein for venipuncture then place the tourniquet 3 to 4 inches above the chosen site. Do not place the tourniquet tightly or leave on more than 2 minutes. Prepare the site. When a vein is chosen, cleanse the area using alcohol in a circular motion beginning at the site and working toward. Draw the sample. Ask the client to make a fist. Grasp the client’s arm firmly using your thumb to draw the skin taut and anchor the vein from rolling. Gently insert the needle at a 15 to 30º angle through the skin and into the lumen of the vein. Fill the tube. Obtain the needed amount of blood sample, then release and remove the tourniquet. Remove the needle. In a swift backward motion, remove the needle from the client’s arm. and apply a folded gauze over the venipuncture site for 1 to 2 minutes. Label the tube. Label the tube with the client’s name, date of birth, hospital number, date and time of the collection. Transport specimen. Deliver the specimen to the laboratory for immediate processing and analysis. I am last year bsc nursing student. This website helped me a lot in my academics. Thankyou for such a nice website with superb notes.